Motion activated outdoor security lights are a great way to automatically provide you and your family safety and security all at a reasonable price. Research has demonstrated that light is an incredibly powerful crime deterrent- and lighting fixtures and floodlights that intelligently activate when sensing motion is a robust preventative security measure to keep your home safe while you were away, or even if you are indoors. Some of the motion sensing outdoor security lights are solar-powered while others run off of batteries. While inexpensive, users who have reviewed these motion-activated security lights say that there is a bit of a trade-off purchasing lower-cost lights. Sometimes they lack higher-end adjustability features- but that is not unexpected. Our favorite overall is the Brinks 7131 motion-activated floodlight. Let's take a look at five of the best-selling outdoor security floodlights on the market today. The Brinks 7131 is our top-reviewed choice. These are two-headed security floodlights that feature a 240° zone of motion detection. They will automatically activate at dusk and then deactivate themselves at dawn. They also include options for a manual override enabling you to turn them on using a wall switch whenever you want. The manufacturers claim a 70 foot detection range and they come equipped with a EZ-N-Stall connector to expedite wiring to the fixture of your home. The lights themselves are 120 watt outdoor lamps. Unforunately they are not included but the bulbs are, unlike some other options, protected by lamp shields. Users who reviewed this unit commend these motion-activated security floodlights for being inexpensive, their out-of-the-box functionality, solid metal construction, infinite sensitivity adjustments, as well as duration adjustability and robust testing mode. As well, users say that they are pretty easy to adjust so that you can configure where you want to aim it and the wide-angle sensor covers a pretty large swath of terrain. However, some users thought it could be easier to adjust their direction once installed- a bit of a bone of contention. Though in general users have said that for the price this is not entirely unexpected. Users write that the Heath Zenith motion security light does not activate during the day, unless it is incredibly overcast and it features precision sensitivity and distance adjustments. 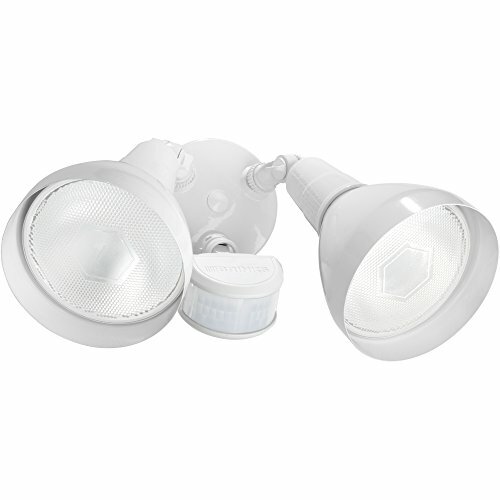 In general users commend the Heath motion security floodlights for their easy and effective provision of security, their energy-smart efficiency, the thoughtful design that has gone into them, their ability to work with compact fluorescent bulbs, a robust ten year warranty and their low cost. That said, some users have complained that occasionally they have received faulty security lights- but this isn't too much of a big deal since as the most inexpensive floodlight available, it's sort of comes with the territory. Plus the 10 year warranty effectively covers all of these problems. One user writes that they are a bit of a hassle to install, mainly because a lot of the wires bunched up behind the floodlight lamp controls causing them to stick out. This particular user had to coordinate them back inside of the wire box housing and then seal it with silicone. Another user comments that these are mass-produced security floodlights, which means that install is pretty standard across the board. He says that as soon as you have the electric box prepared, what you will need to do is to attach the metal piece to it, screw it in and you are good to go. Users sometimes say that motion detection can be incorrectly activated by swarms of insects or if the sensor itself has become dirty. One feature that users really liked was having bulb hoods that were durable and attractive- this is a great way to keep the floodlights protected and the motion activation insured for the long-term. Outdoor motion-detecting security lights can be an effective and inexpensive way of boosting the safety of your home and property. Criminals hate lights-and if they are creeping up to your property and all of a sudden the floodlights blaze on, illuminating them, it's likely that they're going to turn tail and run. 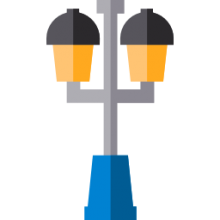 Generally, these outdoor security lights will have two bulb heads and each of them can be independently arranged. This allows for pretty wide range of security coverage. It's useful for the bulbs to have adjustability so that you can point them away from neighboring properties, or angle them towards areas of your property that you feel are particularly prone to intruders. Generally these outdoor security floodlights will accommodate a range of bold wattages, with the most commonly use being the 75, 90 and 100 Watt bulb varieties. As you go up in wattage, sometimes even as high as 500 Watts, they will become a bit more expensive. Another option that some property owners investigate is installing a motion sensor with pre-existing floodlights- this can be an interesting option if you already have lights installed that you like. It's important to note that these are not security spotlights, instead be some more like floodlights that provide a wide dispersion of light. When choosing a security light you should be aware of that distinction- with high intensity discharge lights providing a spotlight that is an entirely different animal than a security spotlight. Solar-powered security floodlights are another type and style of outdoor security lights- these do not use batteries and instead, as the name indicates, are completely solar-powered with either regular or halogen types of bulbs. If you are considering purchasing a motion security light for your property, check out our comparison table & review above. You will want to read the product pages of the individual security floodlights to discover how tricky or difficult they are to install on your specific property. While these are pretty inexpensive, and some users are used to getting faulty units, that is obviously something you want to investigate prior to purchase to ensure that warranties cover any defects.